Saint George (c. 275/280 – April 23, 303) is the patron saint of England. According to a legend, Saint George of Lydda killed a dragon and saved the lives of many people. It is sometimes called 'The Golden Legend'. It is a legend that is older than Christianity, which some people believe is based on gods from different religions, such as Sabazios. A city called Silene had a large lake, where a plague-bearing dragon who breathed fire and disease lived. The dragon poisoned all the countryside. To please the dragon, the people of Silene gave it a sheep every day, for food, and when there were no more sheep, they gave their children to the dragon. The children were chosen by a lottery. One year the lottery chose the King's daughter. The King, sad and desperate, asked the people to take all his gold and silver, and half of his empire - but only if his daughter could be saved. The people refused. The daughter was sent out to the lake, dressed in white as a bride, to be a fine meal for the dragon. Not knowing this, Saint George was riding past the lake on the same day. The princess, terrified and trembling, tried to send him away, but George said he would stay and protect her. The dragon came suddenly out of the lake while they were speaking. Saint George made a gesture called the Sign of the Cross, jumped on his horse and advanced toward the dragon. He used his long spear to hurt the dragon badly. Then he asked the princess to throw her long pretty belt to him. He put the silk belt around the dragon's neck. Now, the dragon followed the girl like a humble pet follows its master. The Princess and Saint George took the dragon back to the city of Silene, where the people were terrified to see the dragon enter. But Saint George told them not to be scared. He said that if the people became Christians and went to Church to be baptized, he would kill the dragon immediately. The king and the people of Silene converted to Christianity, George killed the dragon with his sword, 'Ascalon', and its body was taken out of the city on carts. Fifteen thousand men were baptized, not counting women and children. On the site where the dragon died, the king built a Church for the Blessed Virgin Mary and Saint George. From the altar in the church came a fountain of holy water. The water cured any disease. The story of Saint George and the Dragon symbolizes when good wins over evil, and is very famous. Compare Book of Revelation chapters 12-13. It is the subject of a lot of art through many centuries. In Sweden, the Princess symbolizes the nation of Sweden, and the dragon represents a foreign army of enemies. The story was passed from parent to child through songs in Russia. It was also made into the story 'The Reluctant Dragon' by Kenneth Ransome, which was made into a Disney film. Saint George's Day (also England's National Day) is on April 23, although this is not a holiday in the UK. He is the patron saint of many other countries, too - including Greece, Palestine, Georgia, Portugal and Russia. Moscow, Russia has 41 Churches with the name of Saint George, and the Moscow city Coat of Arms, or symbol, is of Saint George on a horse killing the dragon. Saint George is the patron saint of the Boy Scouts of America. On St George's day some people in England wear a red rose, or put an English flag in their window. The flag of England is white with a red cross. The design of the flag is often called 'The Saint George Cross', or 'The Colors of Saint George'. Saint George in the Acta Sanctorum, as collected in late 1600s and early 1700s. The Latin title De S Georgio Megalo-Martyre; Lyddae seu Diospoli in Palaestina" translates as "St. George Great-Martyr; [from] Lydda or Diospolis, in Palestine. 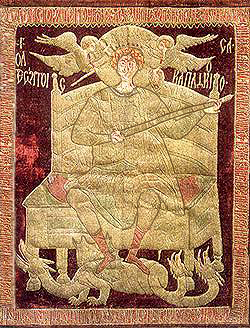 Russian icon (mid 14th century), Novgorod. Saint George was a knight from Cappadocia, who rescued a maiden princess from a dragon at Silene in Libya, leading to the Christianization of much of her father's kingdom. Depiction here by Dante Gabriel Rossetti. English recruitment poster from World War I, featuring Saint George and the Dragon. Saint George's monument in Tbilisi, Georgia. Saint George Facts for Kids. Kiddle Encyclopedia.